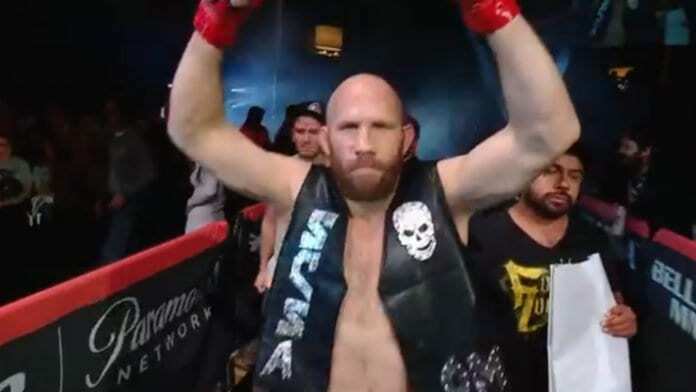 Bellator 219 star David Rickels is known to dress up as a caveman for the entrances of his fights. Well, in his most recent fight, he dressed up as WWE Hall of Famer “Stone Cold” Steve Austin for his entrance. The MMA Veteran took A.J. Matthews on the undercard portion of the event that saw Rickels win by second-round TKO. After the fight, he hit Austin’s finisher, the Stone Cold Stunner. Brandon Girtz def. Saad Awad by unanimous decision (29-28, 29-28, 30-27). Daniel Straus def. Shane Kruchten by submission (rear-naked choke) at 3:53 of round one. Andrey Koreshkov def. Mike Jasper by unanimous decision (30-27 x3). Joe Schilling def. Keith Berry by unanimous decision (30-26 x3). Joey Davis def. Marcus Anthony by KO at 4:21 of round one. Dalton Rosta def. Cody Vidal by TKO at 1:06 of round one. Shawn Bunch def. Dominic Mazzotta by unanimous decision (30-27, 30-27, 29-28). David Rickels def. A.J. Matthews by TKO at 3:24 or round two.